For decades, silver amalgam fillings were used to treat cavities . This mixture of metals, including mercury, is still used today to fill holes in the teeth resulting from decay. In recent years, more options have become available due to advances in restorative dentistry. These options include tooth-colored fillings. Also referred to as white or composite fillings, these restorations match the natural color of your teeth so that they are virtually invisible. They also do not contain mercury, which some Wilmington patients prefer to avoid. Tooth-colored fillings have gained popularity over the past several years. They have become a staple in cosmetic dentistry, and are now used for restorations that in previous years would have been filled with a silver-colored amalgam. These natural-looking fillings make it appear as though they did not require treatment. Because of the more natural appearance, as well as due to concerns about mercury, some patients have made the choice to have their silver restorations replaced with tooth-colored fillings. Tooth-colored fillings are typically made of a composite resin material, though ceramic fillings may also be used. You and your dentist can decide which is the better choice for your needs. Composite resin is used more frequently. It is both easier and less expensive to use, but is slightly less durable than ceramic fillings. Both materials seem to be slightly less durable than traditional amalgam, although in many cases, the lifespan of the filling is similar. Other advantages of tooth-colored fillings are related to the properties of the resin versus the properties of the silver amalgam. Tooth-colored fillings, whether they are resin or ceramic, do not conduct heat or cold. They will not expand or contract in the presence of hot or cold foods, making them less likely to damage the natural tooth structure. How your filling is placed depends upon the restoration material used. Composite resin works much like mercury amalgam. The dentist places the resin in the space where the decay was removed, then shapes the filling material to fit the space. It is cured with a special light, and after the resin has hardened, the dentist refines the shape of the filling so that it perfectly fits your natural bite. Ceramic fillings are more complex. Like dental crowns, ceramic porcelain fillings are custom-made from a mold your dentist takes of your tooth. Typically, they are manufactured off-site and then placed precisely and cemented in place by your dentist. 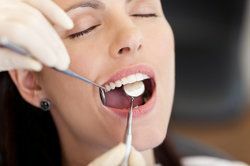 Your dentist will also make any necessary adjustments to ensure your natural bite remains intact after the placement of the filling. The choice between these two types of fillings depends upon your preference as well as your dentist’s recommendation. While composite fillings tend to be less costly, ceramic fillings tend to last longer. You should discuss all options, along with their advantages and disadvantages, with your dentist before making a final decision. If you’re interested in learning more about tooth-colored fillings, schedule a consultation with Emmi Dental Associates today. Whether you need a new restoration or would like to have old fillings replaced, we’ll be sure you achieve the luminous smile you want.